Living in Rome, you might think we stroll to the market in the morning, lovingly selecting the perfect vegetables for dinner. 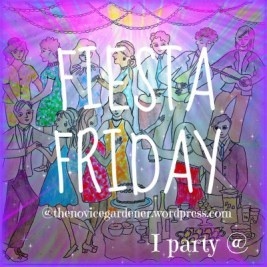 Well, that is often true on the weekend, but weekdays I swing by the Egyptian fruttivendolo on my way home, and buy something from the cheaper section outside. One euro a kilo, slightly battered: last time I bought aubergines, to make Nigel Slater’s Grilled Eggplant with Creamed Feta. Delicious! We oven-roasted the aubergines, grilled would have been even better. Great with the feta and yoghurt. But we had lots of roasted aubergines left the next day, so what to do with it? Roll it with ricotta, bake it with cheese, hmmmm? There were also some wrinky cherry tomatoes lurking in the fridge, and I fancied pasta, so I tossed in some almonds and hoped for the best. This is my humble Fiesta Friday 35 offering this week: a humble weeknight pasta dish, but quick to make, and tasty enough to serve friends. Thanks as always to our hosts: this week, Angie, Prudy and Naina. I already have my eye on those tasty apples pies, mmmmmm….. Put your water for pasta on the boil, and cook pasta while you prep the sauce. In another pot or pan, gently fry the chopped onion in the olive oil until it softens. Halve the cherry tomatoes, then tip them in with the onion and let them cook for a few minutes. In the meanwhile, using a food processor (or excellent knife skills), roughly chop the almonds. Add the slices of roast aubergine to the food processor with the almonds, and chop roughly. Now, tip in the tomatoes and onion, and process until it is smoother but not enturely homogenous. You should still feel the slightly gritty almond buts. Add salt and pepper to taste. 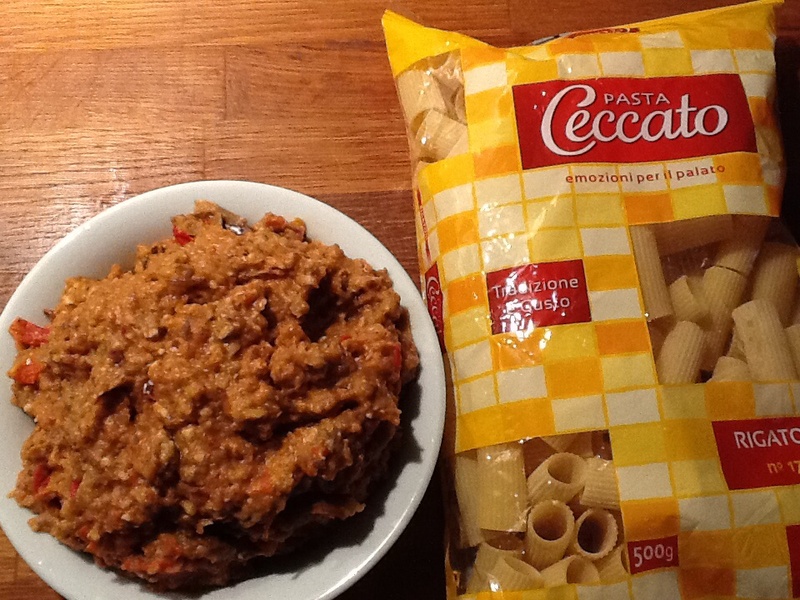 It may not look pretty, but see how you like the flavours.. 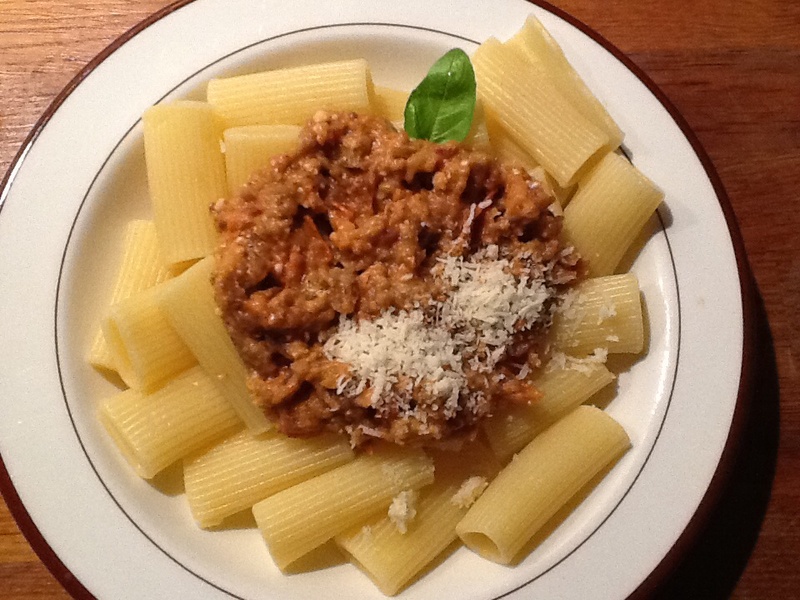 Drain pasta, ladle sauce over, and enjoy! Add parmesan if you like (we do) and basil leaf for garnish if you have some. 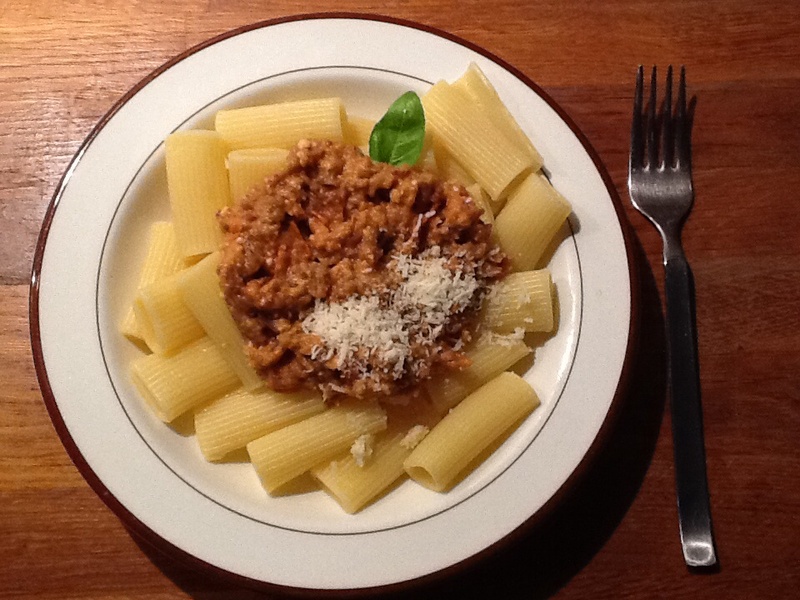 Notes: I had seen a recipe for aubergine walnut pasta, with hard boiled egg yolks and tomato sauce, but was too hungry to boil eggs as well. I would have added sage, but the sage on our balcony died in the August heat and has not yet been replaced. With in-laws arriving in two weeks, reviving the balcony boxes is a project for this weekend. That, making sure we have enough tea bags to make endless cups of builder’s tea, and scrubbing the kitchen. “They will not mind!” says my husband, but I do. You could make this with less tomatoes and add olive oil, but we wanted to keep this light. More fresh basil could be nice too. A great weekend to all! 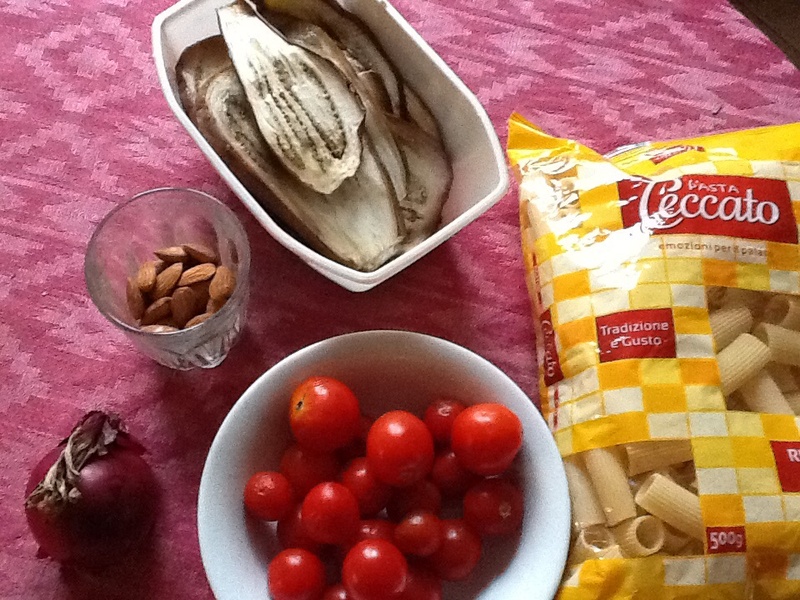 This entry was posted in food and tagged almonds, aubergines, Fiesta Friday, pasta, tomatoes on September 26, 2014 by krumkaker. Today I saw the first pumpkin in the fruit and veg shop, a definite sign that summer is on the wane. Not that you would know from the weather, it was 28C again today and a slightly sticky walk back from the metro. Schools are starting up, and shops are re- opening after the summer holidays, including the pasta shop downstairs, finally open again. I do fancy pasta, but I was too hot to contemplate cooking anything, so a caprese it would be. Getting tomatoes, I saw the orange pumpkin wedges in plastic bags, next to the till and the vertiginous piles of fresh grapes. Zucca! Pumpkin, already! Here I have been thrilled about the temperature dropping a bit, though you can still go out without a jacket. The nights are cooler, which is blissful, and suddenly the buses (still iregular) are busy again. Still, I am not sure I am ready for the Roman summer to be over just yet, I want a few more enjoyable weeks of sun and wearing pastels and eating watermelon. Seeing the pumpkin wedges reminded me of autumn, of spicy soups, of needing to wear socks again. No, definitely not ready for that after months in sandals. Autumn means there will be rain, and more bus strikes, as well as being time for the long, argumentative, mosquito-ridden meeting of our building’s tenants. No, a little more summer tranquility would be much more preferable. By now I was hot, but home. Time for a quick cold shower, while my lovely husband assembled a caprese salad. Isn’t that pretty? No recipe needed: just a few fresh tomatoes, some good mozarella, a few basil leaves. Salt, pepper, a drizzle of olive oil. Just the perfect summer food, for a lovely September summer evening. 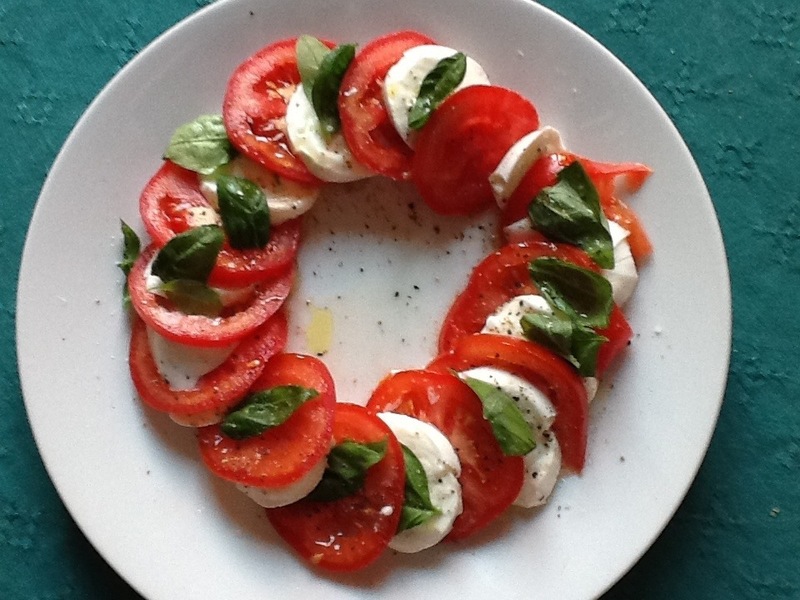 This entry was posted in food, Rome and tagged mozzarella, summer, tomatoes on September 4, 2013 by krumkaker.